If you haven’t already tuned out any conversation about giving your children cough and cold medication when they’re under the weather, this should do it. The Food and Drug Administration has strengthened its warning on prescription cold medicine, stating that no product containing opioid ingredients such as hydrocodone or codeine should be given to children – of any age. That’s ages 0-17, in case you’re wondering. What about over-the-counter cold medication? Well, in the past decade, the FDA has already issued several warnings and required language to be added to labels limiting their use in kids. 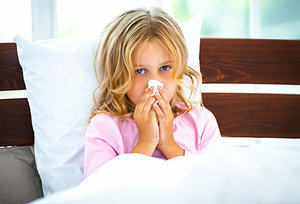 In fact, a consumer update on the FDA website titled “Most Young Children With a Cough or Cold Don’t Need Medicine” makes its position abundantly clear, especially for the youngest (ages 2 and under); while a 2016 update, “Use Caution When Giving Cough and Cold Products to Kids,” offers additional safety information and includes alternative treatments that may work better. What alternative treatments? The FDA mentions cool mist humidifiers, saline nose drops / spray, and drinking plenty of liquids among the nondrug options. We would be remiss if we didn’t add honey; such a simple remedy often overlooked by parents rushing to the drugstore for a quick fix to their child’s discomfort. For example, a Pennsylvania State University College of Medicine study found that children given buckwheat honey before bed coughed less and slept better than children who didn’t receive honey. And other research suggest zinc lozenges may be effective for resolving cold symptoms in children and adults, particularly if taken within close proximity to the arrival of symptoms.